To save you from the frosting weather conditions, an electric blanket comes in handy. It is a pretty convenient and standard product that’s run on electricity, unlike traditional fabric-only blankets. And as opposed to what you would have always been thinking, electric blankets of today are absolutely safe and can even be washed in a washing machine. Once you’ve made the decision to purchase a new electric blanket, you can stay worry-free from this particular aspect. And in fact, it is also recommended to wash your electric blanket before using it for the first time as you never know what allergens might irritate you. Gentle washing is required and you can ever machine dry the same on the lowest settings. 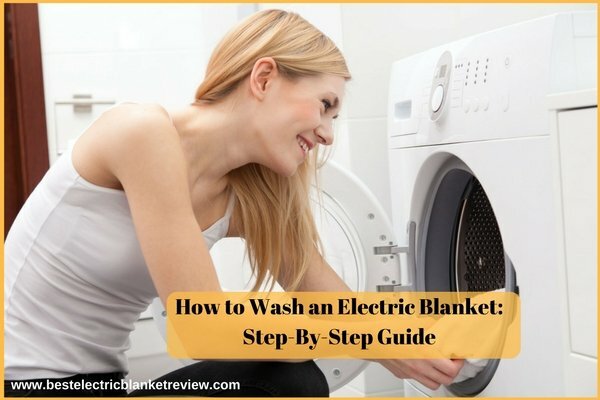 So, here is how to wash an electric blanket the safest way. Every electric blanket comes with an attached power cord that allows the product to start operating when plugged in. This will power on your blanket and ensure that it’s running right. But, when you want to wash the blanket, make sure that the power cord is plugged off at least an hour before so it disposes of the current during that period. It is the same as any other heating equipment that would require attention and caution before getting into the water. In case the fabric of your blanket is torn or the wires are worn out, immediately discontinue the use of your blanket. Before starting with the washing procedure, thoroughly read the user manual and the manufacturer instructions attached to the fabric. Check if there are any particular washing directions. If not specified, go for a pre-soak along with gentle washing and a brief rinsing cycle. A majority of manufacturers suggest soaking the electric blanket in detergent for a good 15-20 minutes before washing. In addition to pre-soak, they also direct the user to use particular temperature water for the same – cold, lukewarm or hot. If that temperature isn’t maintained, there are chances that the product can damage. However, if you do not find any instructions mentioned, go for a 15-minute soak in cold water with any mild detergent. Now that you have soaked the blanket in cold water for 15 minutes, you can finally wash it off gently. Modern technology blankets come with advanced wiring mechanism that keeps the electric system absolutely safe along with the user fully protected. But, just make sure that you choose to wash on the lowest settings (delicate or gentle mode). And do not use any kinds of fabric softeners or bleaches. These chemicals can easily intrude into the wiring system. By this, we mean that you can rinse the electric blanket but make sure that this period is even shorter. Simply a minute’s rinse will solve the purpose. Use lukewarm water for the same as that’s the standard recommendation. A majority of blankets also benefit from a single spin. But, in the end, you must be aware of what works for your particular product. Your dryer must be big enough allowing the electric blanket to tumble freely. Certain dryers may require a pre-heat setting. So, follow the manual on drying instructions and use the lowest possible setting unless stated otherwise. You do not have to fully dry the blanket in the dryer. Get it out while the fabric still feels a bit damp, stretch it fully to get rid of any stubborn folds and simply hang it up for air drying. Call someone to help you in case you cannot reshape the blanket alone. Make sure that the blanket is absolutely dry before you power on the blanket for use. Follow these important directions. Do not send your electric blanket for dry cleaning. Take proper care when washing with hands. Choose a mild detergent as it does not interfere with the electrical mechanism. And easily wash your electric blanket stress-free !